TEWKSBURY, Mass., May 2, 2017 /PRNewswire/ -- Since Jan. 1, 2015, Raytheon's [NYSE: RTN] Patriot™ integrated air and missile defense system has shot down more than 100 tactical ballistic missiles in combat operations around the world. 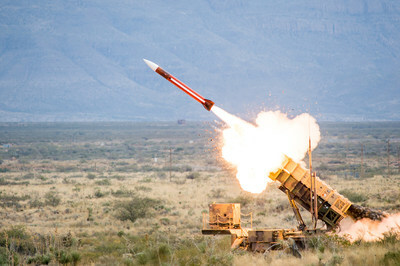 More than 90 of those intercepts involved the low cost Raytheon-made Guidance Enhanced Missile family of interceptors. "No single interceptor is a silver bullet," said Ralph Acaba, Raytheon vice president of Integrated Air and Missile Defense. "Using a mix of defensive missiles increases cost-effectiveness and gives commanders operational flexibility to choose the right interceptor at the right time." The Patriot program generates more than 15,000 jobs in 45 states at Raytheon and across 2,200 defense suppliers. Patriot's total domestic economic impact, including the indirect contribution of consumer goods and services, exceeds 44,000 jobs annually. This document does not contain technology or technical data controlled under either the U.S. International Traffic in Arms Regulations or the U.S. Export Administration.